A to Z Challenge 2014: A is for Ampersands. Right or Wrong? Pretty, aren’t they? Ampersands can be artsy and fanciful depending on the fonts you use and the purpose you have in mind. But beauty aside, how useful are they? And why do I call the use of ampersands a quirky error in writing? Ampersands are twisty little symbols that look somewhat like the salty pretzels (Auntie Annie’s Ampersands?) that you buy at the mall. The ampersand is shorthand for the word “and.” Blame this funny little symbol on the Roman scribes of the first century AD who chiseled lofty inscriptions on their blocks of marble, joining two letters to save a bit of room on their fine craftmanship. After all, you wouldn’t want to shortchange an emperor would you? The consequences could be deadly! Despite its noble and historic beginnings, the ampersand has persisted through the centuries to modern times even though we rarely write on marble these days. Today the ampersand has its friends and foes, each arguing eloquently for why or why it shouldn’t be used in writing. That little mark has blogs, books, and websites dedicated to it. Who would have guessed that this little squiggly would have such power? Well, friends and foes of the ampersand, there are times to use the ampersand correctly and times when it should not be used at all. Now the ampersand is fine on Facebook, Twitter, and Pinterest; in thank-you notes to your mom or loaded missiles to your significant other; on attention-getting T-shirts and tattoos on your pecs and abs; and even on the doodles you draw in the margins of your notebook in your boring stimulating English class. But, please, don’t use ampersands in more formal writing of term papers, journal or newsletter articles, or fiction or non-fiction books. Being a picky newsletter editor, I get irritated when I see the ampersand in articles repeatedly substituted for the perfectly fine “and.” Why bother to reach up and hit shift and the number 7 key to type an ampersand (&) when you could type the word and just as quickly and be done with it. Yet, to be fair, there are times when the ampersand may be desired and even required! 5. On movie credits where the use of the ampersand attempts to show levels of input each scriptwriter has had in the development of the screenplay. Look for it in the credits the next time you go to the movies. 6. In bibliographies in cases where the & is part of the official title or publisher’s name (as in the examples above). Hungry now? 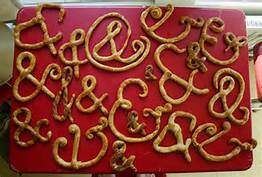 How about a nice salty pretzel ampersand? Mustard or cheese with that ampersand? 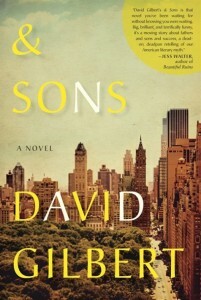 Your turn: What quirky errors do you find in writing? Which ones annoy you the most? Janice Hall Heck is a retired educator and now nitpicky editor of On the Horizon, a bi-monthly community newsletter for Horizons at Woods Landing, Mays Landing, NJ. Very interesting 🙂 To be honest, I hadn’t really thought about the ampersand. I do agree that it shouldn’t be used in formal writing. But when you have to save space on Twitter, it seems silly not to use it. You are right. Anything goes on Twitter…characters count! Thanks for visiting my blog. I like Auntie Annie’s Ampersands the best! Thanks for visiting. Nice to meet you, Kate. The ampersand can annoy me when I see people using it in a lazy way. I’ve done briefings for senior executives and sometimes I would see a slide of all text — and every and was an ampersand. It just seemed so lazy! How hard is it to spend ‘and’? I am always annoyed to see apostrophes used in words that are the plural of nouns. It is so common in the last few years that I know it will become the norm for today’s youth and therefor, for their children. I’ve seen it in billboards and in public buildings….Closed Saturday’s; television’s on sale, etc. It seems picky to be annoyed by it, but I see it so often that soon those of us who use it correctly will annoy those that are using it incorrectly. Right, Carol. In fact I collected a photo example today for a future blog post on misplaced apostrophes. I may quote you on that post. You are also right about how things change. Maybe apostrophes will be dropped altogether in the future.